As Shen Yun Performing Arts continues its tour of Eastern Canada, the acclaimed classical Chinese dance and music company is leaving a trail of enchanted theatregoers in its wake. Having already played in Hamilton, Kitchener, Ottawa, Montreal, and Québec City, Shen Yun wrapped up four full-house shows at the Living Arts Centre in Mississauga on Sunday, Jan. 18, and played the first of a six-show run in Toronto on Jan. 21. I take my hat off to them. It’s wonderful. Celebrities, government officials, artists, executives, and arts patrons of all kinds were in the audience in Mississauga and shared their thoughts after the performances. World champion figure skater Elvis Stojko attended on Jan. 16—his second time seeing the show. After reaching the top in the world of competitive sports, Stojko saw success in a different kind of performance arena—live theatre, big screen, and TV productions—and last March starred in the Broadway production of “Chicago” in New York City and Toronto. New York-based Shen Yun is on a mission to revive China’s 5,000-year-old culture, believed to be divinely inspired. Formed in 2006 by a group of overseas Chinese artists, the company now has four performance companies that tour top venues around the world each year. Joe Daniel, MP for Toronto’s Don Valley East riding, praised the skill of the dancers. “The dancers and the dances were exquisite. The timing was perfect, everybody was beautifully synchronized,” he said. Among the audience on Jan. 18 were Glenn Chipkar and Vivianna Castell, both talented entertainers with a magnetic stage presence and a lengthy list of accomplishments. “It was fantastic, absolutely amazing,” said Castell, who has performed in musical theatre, private shows, commercial jingles, and on radio and TV. I would say it’s a very special portrayal of Chinese history and very spectacular. Chipkar is a well-known Toronto singer, songwriter, and producer of big band shows and many top-40 charted pop songs. He is also an elite athlete—a former world record holder in track and field. “I think they did a great job,” he said, complimenting Shen Yun’s musicians. Fine-art and fashion photographer Bardia Nouri was transfixed by the hundreds of hand-made costumes complemented by colourful high-tech backdrops. Writer Awadh Jaggernath commented on the digitally animated backdrops used to portray vivid background settings behind each story-dance. Chinese society was once rooted in the values of Confucianism, Buddhism, and Daoism and revered principles like compassion, filial piety, propriety, and justice. Shen Yun aims to revive this spiritually rich culture, which has been systematically destroyed over decades of suppression by the Chinese communist regime. 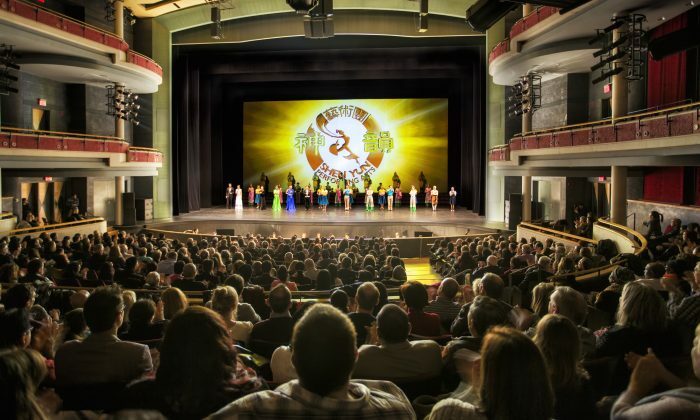 Malcolm West, CFO of GreenField, Canada’s top ethanol producer, said Shen Yun’s mission was both worthwhile and effective. In addition to classical Chinese dance and Chinese ethnic and folk dance, Shen Yun also presents a variety of musical treats. Its unique philharmonic orchestra is blended with traditional Chinese instruments, some of which are also featured in solo performances. Operatic solos, sung in Chinese with the bel canto technique, are also a Shen Yun staple. “The music is wonderful—wonderful,” said veteran radio host Bill Anderson, who currently hosts “Bill’s Classical Jukebox” on the New Classical 96.3 FM. Pedal steel guitar player Al Gain was in awe of soprano Yu Ming—a petite singer with a powerful voice. “Unbelievable voice, range. Sky’s the limit,” said Gain, who has performed all over North America and can be heard on pedal steel anthologies and recordings of country music bands like the Good Brothers. Professional percussionist Mark Joseph has been teaching young drummers and percussionists for almost 20 years. He had warm words for the musicians’ abilities. “I think it came together really well,” he said, complimenting the mix of traditional Chinese and Western instruments. “As a musician I don’t want to be distracted from the overall performance, and all it did was just complement everything that was happening onstage, so it was really great,” he said. Leadership sales coach and trainer George Anastasopoulos said Shen Yun’s artistry was so incredible that it made audiences feel like they were part of performance.